Privacy settings on YouTube allow you to control who can see your videos. There are three settings — Public, unlisted, and private. This article will give you a brief introduction of what those three settings mean, and how to use them. Want to make your YouTube videos more beautiful within minutes? Here we recommend an easy-to-use video editing software for beginner for your reference - Wondershare Filmora. Let's figure out some terms before runing into the how-to part. These are videos that everyone can view. This is the majority of YouTube videos, and just about every one you’ve ever watched will have been public. You'll want this if you want lots of people to watch your video. Unlisted videos are ones that anybody can view so long as they have the link. The video won’t show up on search results or in "related" or "suggested" videos. This is a great setting for sharing a video amongst small groups. You might have a rough edit you want to show a few people, or you might have a show reel that you only want certain people to see. Completely private videos cannot be watched by anyone who doesn’t have permission. You grant people permission by allowing their Google accounts to access the video. Nobody else can see the video, regardless of whether they have the link. It won’t show up on searches, as related or suggested videos, or even when imbedded in other sites. This is the best setting for a video you need to share with only very specific people, if anyone. Below is a comparison table to know more about privacy settings. There are two ways to change the privacy settings: firstly, when you upload the video, and secondly through Creator Studio. 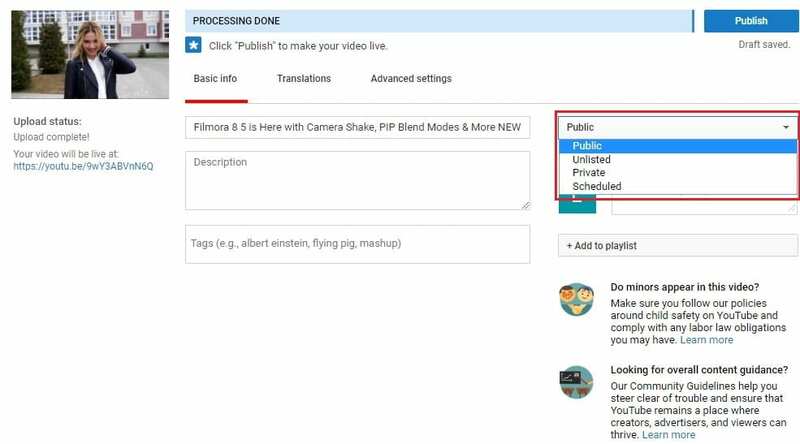 When you upload a video to YouTube you'll see on the right hand side an option that says "privacy". This is defaulted to "public", but you can use the drop-down menu on the button to change the setting. This will apply your privacy setting the second the video finishes uploading and processing. To change the privacy setting later, go to Creator Studio, then Video Manager. On the right-hand side you’ll see one of three icons: a world, a chain, and a lock. The world means "public", the chain means "unlisted", and the lock is for "private". To change the privacy, click the icon. You’ll be taken to the video's info and settings page. Down below where you see the thumbnails you'll see the selected privacy setting. Click this to open a drop down menu, and select your desired privacy level. If a video is set to "private', you'll have the option to share it with specific people. Below where it says "private" on the info and settings page you'll see a button labeled "share". Click this and type in the email addresses of the people you want to be able to watch the video. You’ll also have the option of notifying the people via email that you’ve shared the video with them. And that's all there is to it! Changing the privacy setting on YouTube videos is a simple, helpful tool to allow you to control the audience of you work. Enjoy!